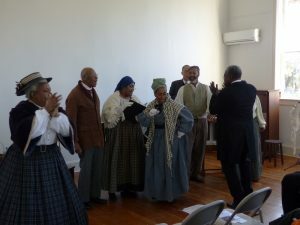 Washington Revels Jubilee Voices performs its second concert for the Black History Program at Historic Pleasant Grove Church, built by the descendants of enslaved people in the 1890s. Experience the traditional music that bound together many African American congregations in the late-19th and early-20th Centuries, with songs of faith & freedom, struggle & perseverance. The program begins with a short presentation on the history of the church and the surrounding area by members of the Friends of Pleasant Grove, and concludes with refreshments and social time for performers and audience to meet and mingle. Learn more about Pleasant Grove here. Sponsored by the Friends of Pleasant Grove. Parking is available in the lot on the far side of the cemetery, which is adjacent to the church.